The Coen Brothers aren’t afraid to try new things, and apparently that includes a six-part movie straight to Netflix about cowboys and the ways they die. Sounds simple, but you know you’re getting something a little more complicated from these two men, and from the cast they employ to weave their tale. Or their ballad, as it were, since the film starts musically and focuses on the title character, although the rest is something far different from what we prepare ourselves for from the beginning. 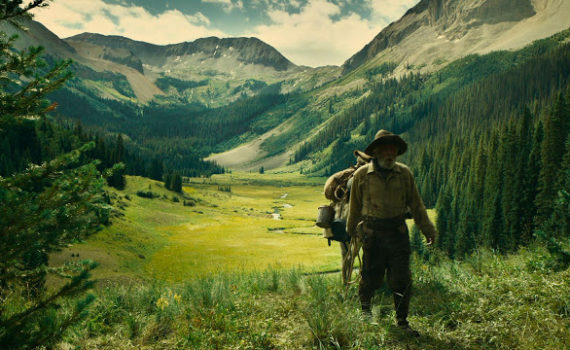 Perhaps that’s the true lesson within Buster Scruggs; to expect the unexpected, because the stories told here don’t go the way you might expect, which, at times, makes them all the more enjoyable. Six segments abut each other over a just-over two-hour span, leaving viewers with a taste of Western life and a fear of their own inevitable deaths. The Ballad of Buster Scruggs introduces us to the fastest son of a gun with a gun, the singing cowboy named Buster who is as quick with a trigger as he is with a tune. Near Algodones takes us along on a bank robbery, albeit one that doesn’t go as planned and takes its bandit on a bumpy ride. Meal Ticket shows us the darker side of show business, how the throat you cut to get ahead might be the one you’re supposed to be feeding. All Gold Canyon presents us with a near-perfect valley, where treasure lies buried and beauty lies all around, but where violence follows close behind. The Gal Who Got Rattled takes us on the Oregon Trail, a journey fraught with peril and with potential. And lastly, The Mortal Remains, when a simple setting isn’t what it looks like. I’m torn between enjoying one of my favorite directing teams and thinking their product was a little too weird. It starts strangely, gets much better, but never quite overcomes its own oddities to become as good as it could potential have been. I strongly disliked three stories, I really appreciated three others, so I land somewhere in the middle and can’t wholeheartedly recommend you run to your basement to turn on Netflix and watch this. It might have worked better as an anthology series, something you could watch a la carte, like Black Mirror, which isn’t always amazing, but has enough moments to make it great. Buster Scruggs simply isn’t a movie, never feels like a movie, and so suffers since it calls itself one. Tom Waits is terrific (see him in The Old Man and the Gun as well), Zoe Kazan’s tale I loved, but I can’t think of anyone else who stood out, and at a little over 2 hours, the pacing was a bit tedious at times instead of constantly remaining engaging. If they really wanted to be experimental, The Co Bros. should have made Buster Scruggs a show, not a film; I really think it would have worked better.